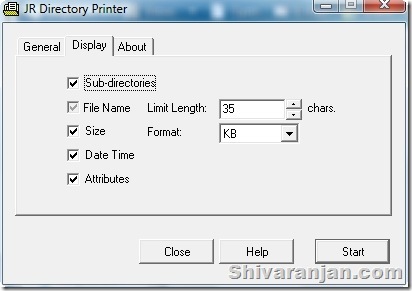 JR directory printer is a free tool with which you can generate a text file with the contents of a folder. This tool offers lot of options with which we can generate the folder content list that suits our requirement. Recurse Sub-directories: Use this option to see a complete list of all subdirectories and all files in all directories. 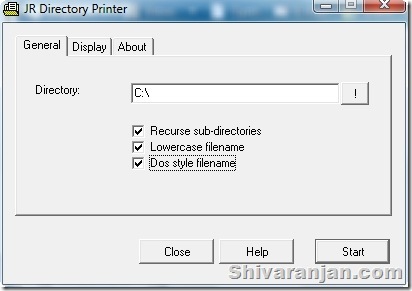 Lowercase Filename: Using this option you can force all file names into lowercase regardless of the actual file name. File Size: Get the file sizes of the files as well in the report that is generated. The best part is that this freeware tool does not require any installation, so you can run this right from your portable USB disk as well. This is the one of the best tools that I have come across and it has found a place in my software collection. This software works flawlessly in Windows Vista as also, but the software creator has not mentioned this.